Petri's map of America with new toponymy on North America's west coast. Americae Sive Novi Orbis Nova Descriptio. / Die newen inseln so hinder Hispaniam gegen Orient, bey dem landt Indie gelegen. An attractive c. 1588 edition of Sebastian Henric Petri's Americae Sive Novi Orbis published in the 1628 edition of Sebastian Munster's Cosmographia. This map covers all of north and South America from a mysterious inland lake (Conibas?) to Tierra del Fuego, and from New Guiana to beyond the easternmost coast of Brazil. This map is Petri's major revision of Sebastian Munster's original 1540 map of America and is based almost entirely on Ortelius' 1570 map of the same region. The map features many of the cartographic anomalies and false suppositions common to the period. 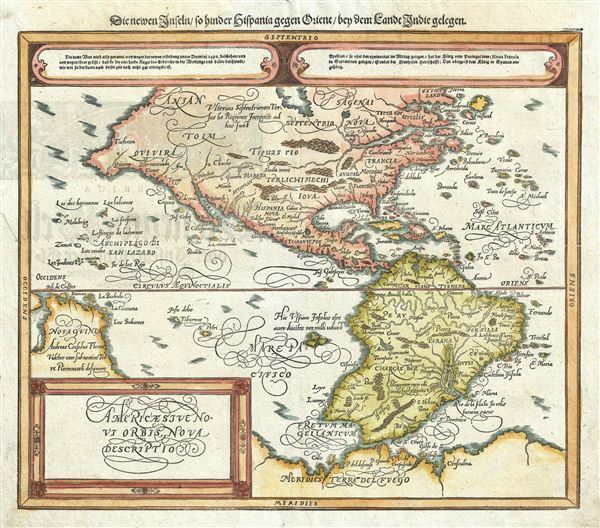 Teirra de Fuego remains connected to the mysterious southern continent - suggesting that information from Drake's voyages had not yet filtered into central Europe. The large bulge on the western coast of South America, near Chile, also remains. A collection of islands in the pacific, situated suspiciously close to the western coast of the Pacific is identified as the 'Archipeago di San Lazao,' a term that Magellan gave the Ladrones, which are in fact located much further west. New Guinea is oversized and apparently connected to the unknown southern continent. IN North America a great bay in inland lake or bay extends into the heart of the continent from the map's border. This is most likely a remnant of Verazanno's Sea and the precursor of the legendary Lake Conibas. On the west coast of North America Quivara, Anian, and Tolm, possibly terms derived from Marco Polo, appear prominently. This map was engraved in woodcut c. 1588 and published in Basel by Sebastian Petri. After 1588, this map was only issued in posthumous German editions of Sebastian Munster's Cosmographia issued in 1592, 1598, 1614, and 1628, and is thus rare. The present example most likely hails from the 1628 edition. Very good. Minor centerfold wear. Pinhole in upper margin, well away from printed area. Minor reinforcement lower centerfold margin - well outside printed area. German text on verso. OCLC 234201672, 43414807. Burden, P., The Mapping of North America, #67. Wheat, C. I., Mapping of the Transmississippi West, 1540 – 1861, v.1, no. 20.